Orzo is a short grain pasta that I think is absolutely perfect for soup. They are slightly larger than a grain of rice in size and go great with veggies or meat. In this soup I have a bit of both in carrots and celery and also chicken sausage. I think the star of this soup however is the lemon. This recipe has very little ingredients and in this case it is a good thing. The lemon taste comes through as the citric acid hits my tongue with that hint of sour that offsets and gives the soup a much more lively taste. After a bowl of this I feel satisfied and am not quenching anything sweet or sour for hours. The kids really like this soup, and smaller kids have no problem handling a spoonful of orzo (whereas other pastas might present some issues). The added Carrots and celery give it a little crunch in texture. Cook and stir carrots, celery, and onion in hot oil until soften for about 8 minutes. Add garlic and shallots, cook for about 1 minute. The name of this recipe already sounds soooo good, I bet it tastes even better. I’m excited to try this recipe at home. It’s healthy and it looks filling, too! That sounds super tasty! I love a bowl of soup on a cold winter day – actually, I crave it when it’s cold out. I can’t wait to try this. my mouth is watering over this and these other ones that were suggested as related posts… i am adding this site to my favorites bar! love! My favorite thing about fall is the beginning of soup weather! This one looks like a keeper! Yum! I attempted to make something like this a while back and it SOO didn’t turn out. This one looks much easier and am going to try this one out it looks delicious! This looks super delicious. I havenever tried making anything with orzo but I love preparing chicken dishes. Yum! 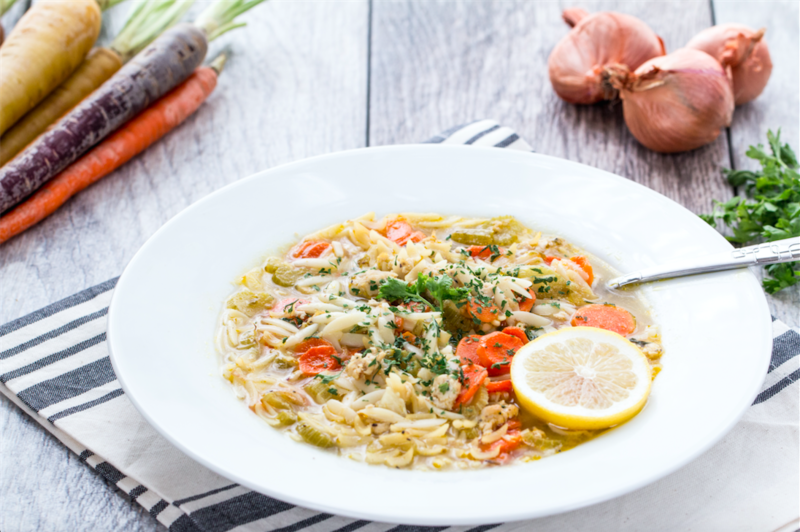 I love chicken and noodle soup, and using lemon and orzo is a great idea. It is finally soup season almost!! My husband loves to take soup for his lunch in the winter and the fall. Oh, I always look for this kind of food for myself – easy and delicious. I have to try this recipe asap! That looks delicious. I like that it’s easy to do. I will definitely try this. Wow! I am a soup connoisseur and this looks absolutely fantastic. My mouth is watering! OMG! I used to buy a Progresso soup that was just like this! Granted this recipe is going to be a million times better but they stopped making that Progresso and I miss it! Totally bookmarking this to make! THANK YOU SO MUCH! These are the kind of things I wish I could cook. It would be something different and nice for my son. However, lemons are quite expensive here but I’m bookmarking this page for future reference. That sounds delicious! I would love to try this. This recipe sounds like it’s great for the whole family. I will have to make this soon after I pick up some lemon juice. This looks so delicious and easy to make. I will have to try this recipe. I love making soup when the weather gets colder. What an interesting dish. I’ve never thought of a lemon chicken soup. I did make lemon chicken before but it was fried. 🙂 That looks good! Even though I don’t eat meat since I’m a vegetarian, I must admit that looks good! I know that my family would enjoy it. Oh wow this does look so good. Love the lemon added to it. Yum. This sounds really delicious. I love the idea of lemon in soup. Definitely going to make this one soon. I just saw this in the grocery and wondered how I would prepare it. Well, now I know! Thanks for the recipe. This sounds like an absolutely yummy recipe. I am going to have to try it for sure. I like that the lemon’s in there. Citrus makes it light and tasty.